If you’re planning a trip to Belgium this year, make sure to include Bruges in your travel itinerary. A quick, 1.5 hour train ride from Brussels and you’ll soon by in what the rest of Europe calls the “Venice of Belgium”! This Foodie Travel Guide to Bruges is all you’ll need to discover the best eats, drinks, and snacks in this gorgeous European town. On our first trip to Europe last year, I exercised my Type A personality by planning every single day, down to every single meal, tour, and activity we would be doing for the next 30 days. It’s the type of traveler I am and thankfully my husband is quite the opposite, so he’s fine with letting me do all the planning. His responsibility is just getting us to all these places on time, because I can’t read a map to save my life. We were to travel between countries in trains and planes, and when I received the email that our flight from Brussels to Berlin has been canceled do to airline employee strikes, I wasn’t very happy. My plans were dissolving as we spoke, with a cancelation of a flight being the worse that could happen (in my mind). Thankfully, my husband suggested we embrace the change and head over to Bruges, a small town of Belgium that he had read about before our trip. The photo below might be familiar if you’ve watched the Colin Farrell movie, “In Bruge“, a satirical comedy of a hit job gone wrong and where the hitman and his partner have to await orders in Bruges, the last place they want to be. Which is crazy, because Bruges might just be THE most beautiful place in all of Belgium! Known as the Venice of Belgium, Bruges will delight even the pickiest of travelers. You can take a train from Brussels into Bruges and as you walk into the town itself, you’re astounded at the gorgeousness of it all. This is what Europe is all about, those historical buildings tucked between the local’s homes, all constructed in another time and as you stroll through, you feel like you’ve just stepped into the past. Bruges has most of its medieval architecture intact, making it one of the most well-preserved medieval towns in Europe. 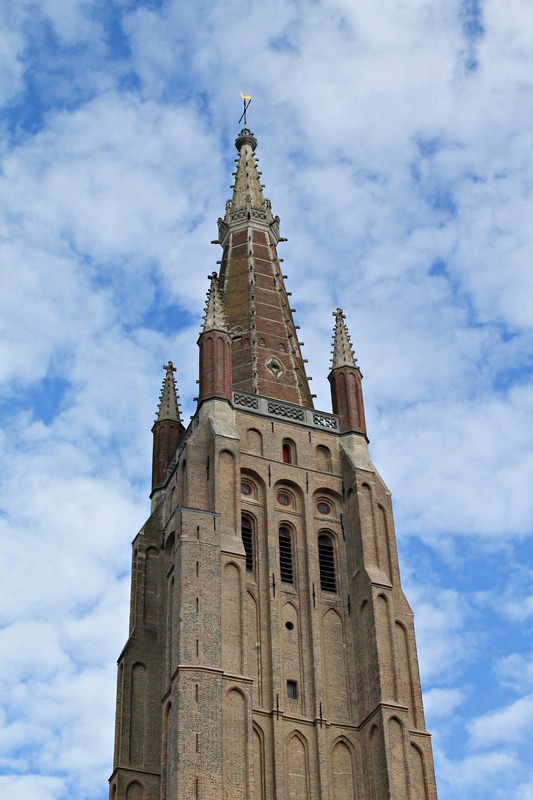 Where to Stay in Bruges: Bruges is a small town, small enough that if you are planning a trip to Brussels, a day trip to Bruges might just be all you need to wander around the canals and streets. If you’re looking to spend a couple of days relaxing and enjoying what this town has to offer, I definitely recommend checking out a local Airbnb, because the homes themselves are cute enough! 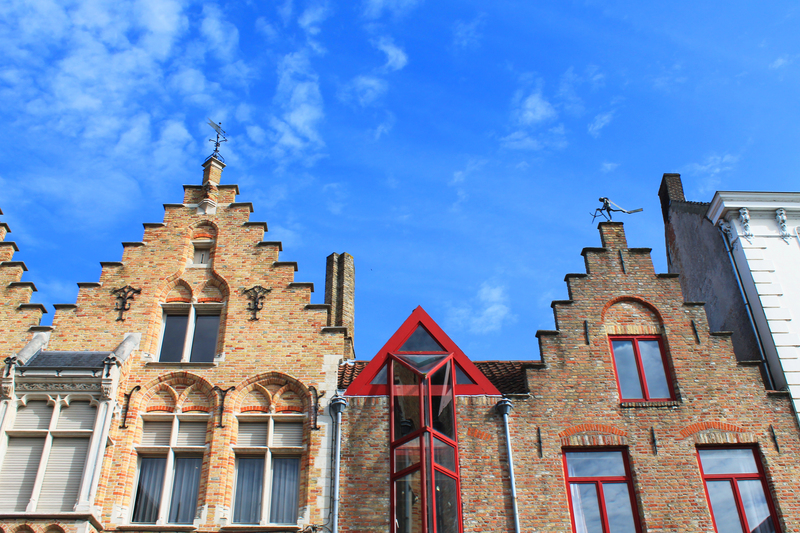 Blogger friends from Kevin and Amanda recommend the Hotel Heritage which they’ve covered and reviewed on their blog, so if you’re looking for a hotel in Bruges, this looks just like the place to stay! 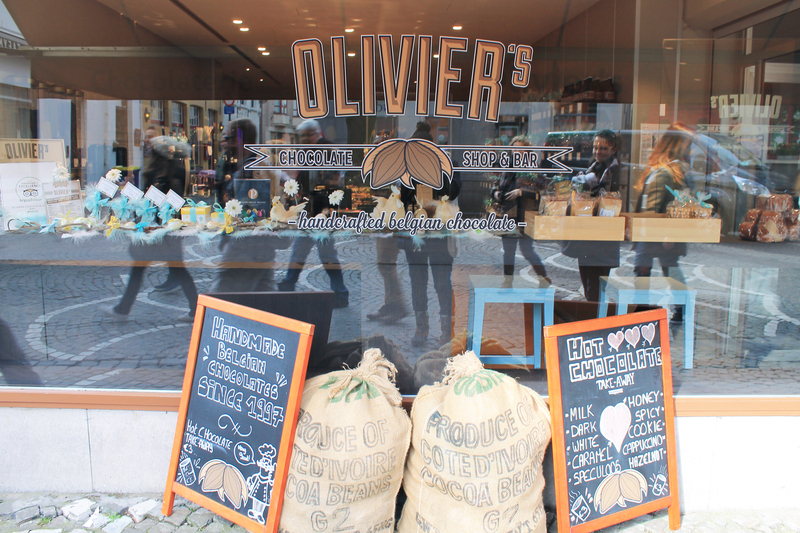 What to eat in Bruges: Now, let’s get on to the real reason you must visit Bruges — the food! There are three main food groups in Bruges and honestly all of Belgium and they are: chocolate, waffles, and beer. Let’s start with chocolate, the reason I spent a couple hundred euros on it, and where to get the best of it. Read my 5 Foods Everyone Needs to Try in Belgium. Chocolate in Belgium is some of the best in the world, pretty much in the same ranks as Swiss chocolate. Belgium has strict laws on the chocolate making process, starting with the fact that all chocolate must have at least 35% of cocoa, which makes for a great standard. It forms an important part of the nation’s economy and culture, where you can get incredibly made chocolate on almost every corner of Belgium. Waffles, Belgium’s favorite sweet snack! In Belgium, there are two kinds of waffles: the Brussels waffle and the Liège waffle. The Brussels variation is a lighter waffle, with folded egg whites and typically just dusted with powdered sugar. 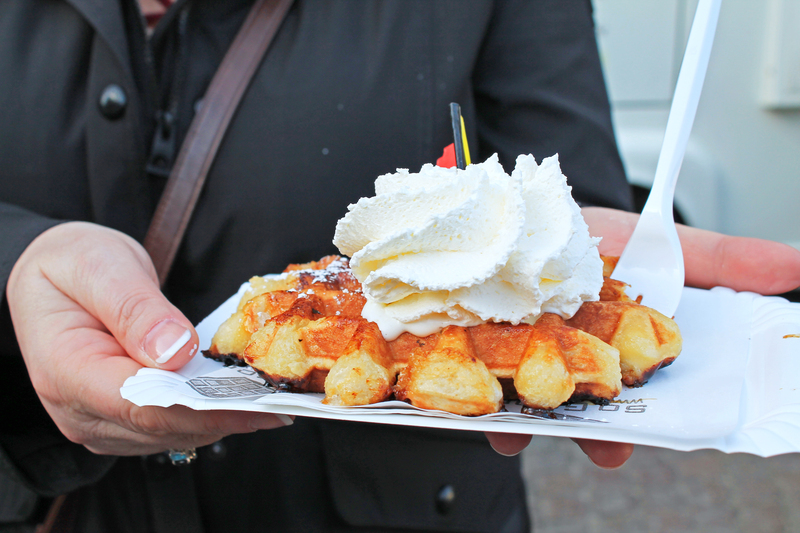 The Liège waffle, pictured below, is a denser dough studded with pearl sugar and typically served with whipped cream. These are sold on every street corner in Brussels and Bruges and I do have a little warning: let it cool a minute before biting down on it, as the molten hot caramelized sugar will surely burn the roof of your mouth. I sadly speak of experience, but I also have to say: it’s worth it if you do burn yourself. 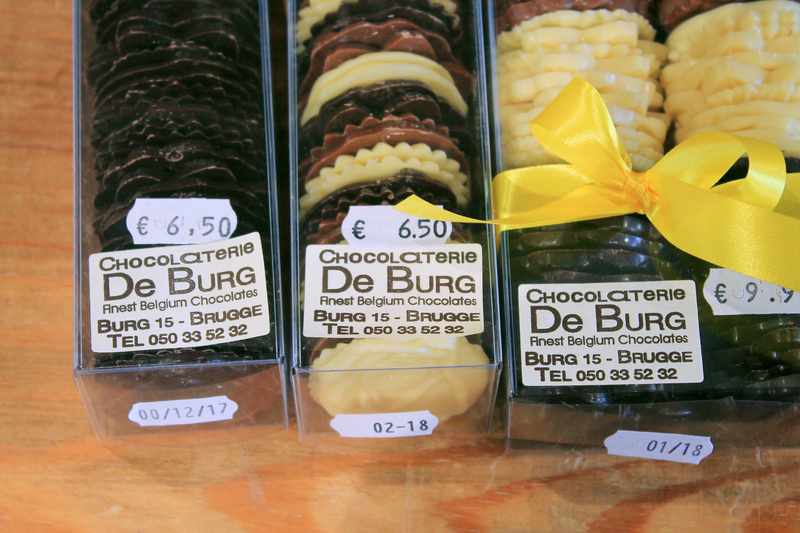 They’re rich, decadent, and not only for dessert, as they make the perfect snack as you explore Bruges. Cuberdons, the confection of Bruges. You won’t find this candy item outside of Belgium because the shelf life is quite short – just about 3 weeks and the candy will start to harden and caramelize. 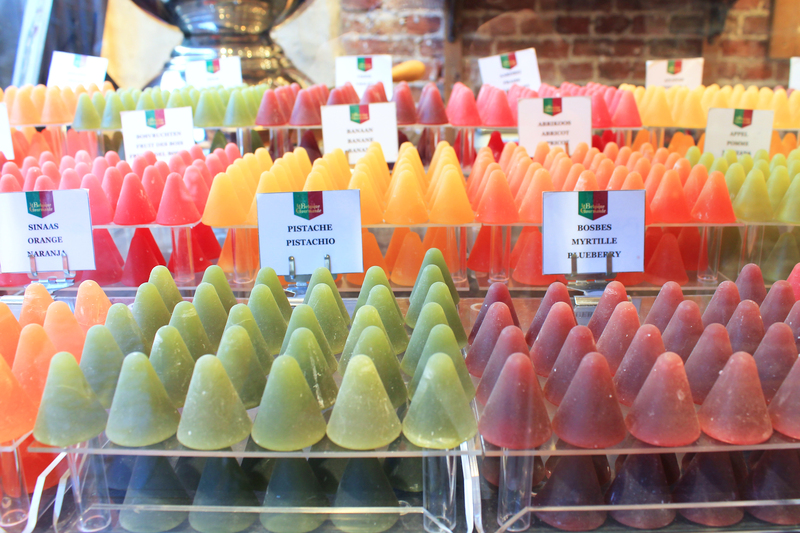 Made from gum arabic and colored with a variety of fruit flavorings, you’ll find every candy shop in Bruges has them. They’re hard on the outside with an inside that’s gummy and jelly-like – quite a tasty, fruity candy and considered a regional delicacy, so when in Bruges, make sure to grab a bag to take home! Now, it’s not all about sweets in Bruges, but I had to showcase the desserts first because my sweet tooth is outrageous. When in Bruges, stop into any mom and pop restaurant for a taste of the local cuisine and the one dish I definitely recommend you getting is Carbonade flamande. A traditional Belgian and French Flemish sweet-sour beef and onion stew made with beer, and seasoned with thyme, bay leaves and mustard. Mushrooms or spiced bread can also be added and it loosely resembles Beef Stroganoff. Order it with French fries and enjoy two of Belgium’s greatest foods at the same time. Check out a list of restaurants to eat in Bruges over on Last Minute. Last, but certainly not least, is Belgian beer. 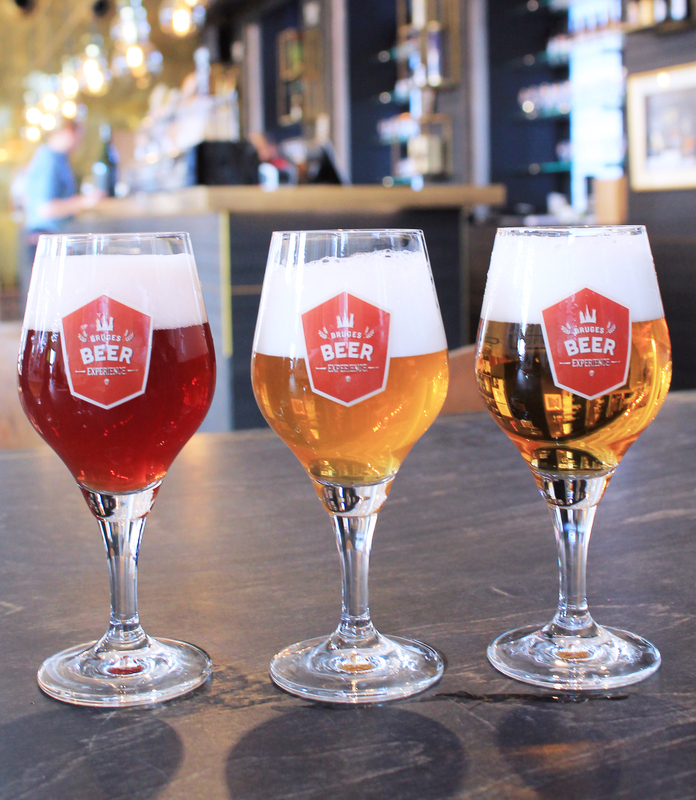 Known around the world as some of the best beer, I recommend a visit to the Bruges Beer Experience, a fresh combination of interactivity, innovative technologies and the stimulation of all senses! It’s not only a museum, but a spot for you to relax and taste a variety of beers. For 10 euros, you can taste five beers, which is a fantastic deal! If a trip to Bruges is on your bucket travel list for 2018, I hope this Bruges Foodie Travel Guide helps you craft a fun and delicious itinerary around this incredible Belgian town. Discover more travel guides here.